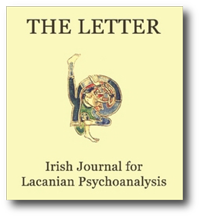 I am very pleased to include the final two sections of Christian Fierens’ book Lecture de L’Etourdit in this issue of The Letter. These are the Fourth Chapter on the First Turn of Lacan’s extraordinary text, entitled The Phallic Function and the Formulae of Sexuation and the section that bridges the First and the Second Turns, entitled From One Turn to the Other. It is perhaps worthwhile reminding readers once again of the slightly complicated sequencing in bringing Fierens’ reading of L’Etourdit to your attention, because I anticipate that the instruments de travail that these texts provide, will be worked with by scholars of psychoanalysis for many years to come. Lacan’s First Turn was brought to you in Issue 41, accompanied by Fierens’ introduction to the text. Further chapter by chapter commentary then appears somewhat later in Issues 51, 52 and 53. The Second Turn of L’Etourdit, published over three issues (43, 45 and 49), is accompanied in each of these is-sues by the corresponding commentary by Fierens. While it is impossible in a brief editorial comment to do justice to the sections of Fierens’ book included in the current issue, I nonetheless have to declare a particular interest in Chapter Four of The First Turn. In Chapter Three of The First Turn There is no Sexual Relationship (Issue 52), Fierens had highlighted that ‘To say ‘there is no sexual relationship’ we must start from relationship (‘in general’) and relationship is always to meaning’. What is truly novel is the equating of meaning with the sexual. It is our under-standing that ‘meaning making’, the relationship of signifier to signifie, or of ‘said’ to ‘said’ becomes the symbolic journey encircling the real, synonymous at this time with ‘the absence of sexual relationship’ or ab-sens. THE LETTER 53 Summer 2013, pages 1-39. Let us take phallic functioning up again starting from the Oedipus complex summarised in the first two formulae of the phallic function. What oblig-es us to go beyond the Freudian Oedipus complex formulated in that way? Free association and the equally floating listening open up the path of ab-sense and of an saying freed from the search for a relationship between meanings. The experience of analysis demonstrates the ab-sense of sexual relationship: there is no relationship between the existences (‘masculine’ and ‘feminine’: nia and nya) and there is no relationship between the two universals (mascu-line and feminine). The masculine Oedipus complex cannot define ‘feminin-ity’. Psychoanalytic discourse gives the means to go beyond the Oedipus complex: it produces the phallic signifier which will mean something quite differ-ent than the phallus. The phallus is reputed to be the sexual copula between the man and a woman; further, its meaning is supposed to condense every meaning among speaking beings. In opposition and as a contrast to this con-ception proper to the phallus, the phallic signifierwill not be a sexual copula, nor will it be the condensation of every meaning. But what will the phallic signifiermean positively? Starting from the ab-sense of the sexual relation-ship, the phallic function opens up a sexual bond between speakers which is based neither on an anatomical relationship, nor on a chromosomatic relationship, nor on a cultural relationship: the phallic function supplies for the ab-sense of the sexual relationship by its own functioning, which is unfolded in the four phallic formulae. THE LETTER 53 Summer 2013, pages 41-46. The starting point of psychoanalytic logic is the Heteros, the ‘notall’. If Plato’s Parmenides opens out onto the Heteros, we must nevertheless await the coming of the practice of ab-sense or psychoanalysis to set en route the logic of the Heteros; for it is only in ‘the equivocation of the signifie’ that the logic of the ‘notall’ appears as logic of the impossible or logic of the re-versal proper to the roundabout of discourses. Already at work in the firsttwo phallic formulae, especially in these naval manoeuvres and these dances with which history is woven, the ‘notall’ must be explained in a second turn. How conceive the riddle of the notall? To the riddle posed by the Sphynx – ‘what is the animal that walks on four paws in the morning, two paws at midday, and three paws in the evening? – Oedipus responded: ‘man’. Far from repeating the riddle of the Sphynx and Oedipus’ interpretation, Lacan asks himself the question: ‘What is a woman’? And he responds by the count of four, two, three: – by the quadrupod of the four places of the dis-courses (chapter 2), – by the bipod of the sexes that remain without a relation-ship (chapter 3) and – by the tripod formed by the two sexes and the phallic function (chapter 4). THE LETTER 53 Summer 2013, pages 47-55. Close attention to Lacan’s writing provides a basis for discerning an account of subjectivity in terms of speech and in terms of the option of refusal of a position as a speaking subject. In this exercise a reference to the Symbolic Order is indispensable. What are the grounds for our insistence on speech being the basis of psycho-analytic practice? It is, to be sure, something more than the slogan that ‘it’s good to talk’. Freud discovered early on that speaking is not simply a medium, the use of which can be cathartic in effect.1 It was because of this discovery that he found his way in The Interpretation of Dreams to the mechanisms of the dream work. Then, again, in Jokes and their relation to the Unconscious these same mechanisms of condensation and displacement are revealed to be operating in the work that produces a joke, the Witzarbeit. THE LETTER 53 Summer 2013, pages 57-85. Some arguments about Lacan’s use of topology are explored in the light of the debate as to whether or not it adds anything beneficial to the clinic of psychoanalysis. This paper discusses the essential difference between sense and meaning and addresses Le Gaufey’s critique of the use of the Borromean knot to support Lacan’s formulae of sexuation. The issues raised by Lacan at the time of his first introduction of the Klein bottle are dealt with in some depth, in order to show the rigour of his endeavour. The addendum clarifiesthe use of the cut and the dimensions in Lacanian theory. Lacan’s use of topology continued from the 1950s to the end of his life, and this project was facilitated by his friendship with the mathematician Georges-Th. Guilbaud. He put an enormous effort into developing this aspect of his work in order to make psychoanalysis an even more rigorous discourse. In 1951, Lacan, Levi-Strauss, Guilbaud, and Benveniste met to work on structures and establish bridges between the human sciences and mathematics. Each made use of the teaching of the other as one might a topological figue. On the basis of that collective effort, Lacan was not satisfiedwith empty talk or mere reflectionson the history of math-ematics. For thirty years, with or without Guilbaud, he engaged in daily mathematical exercises…Privately they [he and Guilbaud] shared a common taste for mathematical games: strings, inflatablebuoys, min-iature designs, children’s cubes, the art of braiding and cutting, Que-neau-like exercises in style. The fieldof topology retained the whole of Lacan’s attention; he never hesitated to blacken reams of paper to teach his audience the elements of his doctrine as transcribed in topological figues.